You know when you see someone, and all you want to do is pass them on a little sunshine. A little tiny something that might brighten their day? In two occasions recently I would have happily passed on some sunshine to a little old lady. Rather, two little old ladies. The first one, just last week. The Monkeys and I were headed to the Post Office. A parcel to be picked up, for an excited Monkey Boy. Outside the Post Office sat two massage chairs. The kind that you see in shopping malls or airports. You place $2 in and get about 10 minutes massage from the vibrating chair. Sitting in the black massage chair sat a little old lady. A fragile looking thing, dressed in many layers despite the warmth of the day. She looked like she had dressed up for her shopping outing. With her necklace wound around her neck, and earrings clasped to her ear lobes. She clutched an oversized shopping bag. Awkwardly holding it close to her chest, head tilted down. She was asleep. Fast asleep. Obviously that massage was very relaxing as she had dozed off quite comfortably. The boys and I kept going, collected our package, lingered a little in a few shops and then passed her again a little while later. Slumped even lower in her black massage chair, mouth opened slightly. I paused a second. Firstly just to watch her chest rise and fall, and then secondly to appreciate that, no she seemed fine. It was just a different place for a nod off. I wanted to place a blanket on her lap, put my hand on her shoulder, see if she was ok. But I also didn’t want to disturb her. She really did seem so peacefully asleep. The second was a few months ago. The Monkeys and I were at the playground. Nobody else was there and they were having a lovely play. Time to finish off and we gathered up our things. As we were collecting everything I noticed in the distance, an elderly lady making her way towards the playground. She had a limp, but it seemed that she was hurrying. The boys and I collected our things, loaded up the pram and headed to the gate. At the same time, the lady reached the gate. As she had got closer, I had really noticed she was hurrying. I opened the gate for her and then shuffled the boys out. The old lady was now alone in the enclosed quiet playground. She looked at me, her face visibly fell, and she slowly limped her way to a seat. It suddenly dawned on me that she had been hurrying to get to us. Presumably for some interaction with the kids. I watched her awkwardly place herself on the park bench looking dejected, all I wanted to do was go back in and send the kids back to clamber around her. We had to go though, we had to get home. So I left that little old lady with the limp to sit there and wait for another child to come to the playground…and it’s tugged at me ever since. Pop all ingredients in to mixer, and mix until throughly combined (approximately 5 minutes, until dough is smooth.) Quick knead and pop the dough back in the mixing bowl, leaving it to prove. Prove for 1.5 hours with two folds in between at the 30 minute marks. To get the sunflower shape. Divide dough, cutting approximately 1/3 off. Shape it into a circle, flatten slightly and rest in the middle of the tray. Divide the remaining dough into equal parts. Rolling to fat sausage lengths, joining them to the circle and lightly twisting around. Don’t make it super tight as it will expand when it proves. 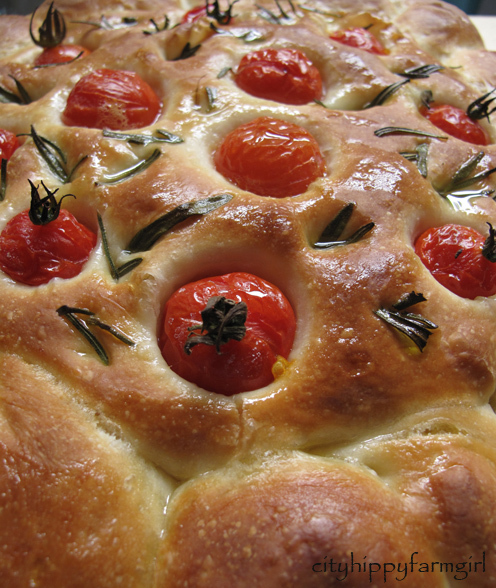 Let it prove for a further 20 minutes and then place your tomatoes and rosemary in the dough. Pushing down into the dough, so the tomatoes won’t pop out when cooked. Prove for another 10 minutes. Grind sea salt over the top and place in a hot oven (250C) with steam. Notes… This olive oil bread recipe is really versatile. I’ve used it quite a few times now, like the Rosemary and Sea salt Grissini. It’s fairly forgiving so you can shape it into anything you want. 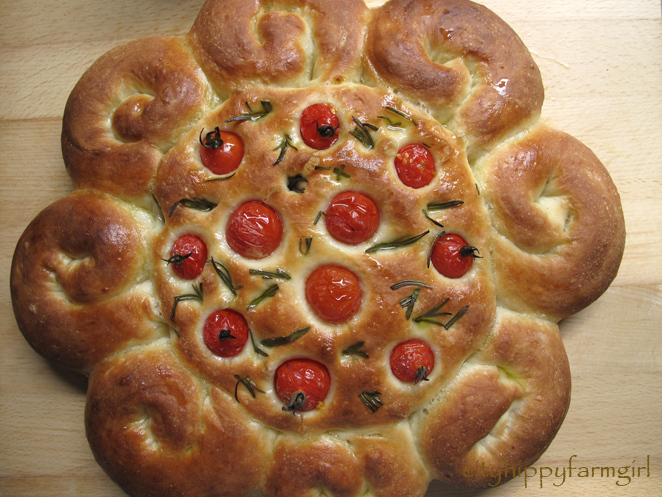 The Sunshine Sunflower Bread was inspired by the lovely Joanna’s bread. Which made me stop, smile, and brought sunshine to my day. This entry was posted in Baking Bread, Connecting with Community and tagged life, old ladies, olive oil bread, sunflower shaped bread, sunshine by cityhippyfarmgirl. Bookmark the permalink. I know exactly what you mean. Be thankful that you notice those things and aren’t so removed from what’s happening around you. I spent a long time last Saturday morning sitting on a park bench out the front of our General Store talking to our elderly neighbour who has about 60 acres and is in her 80’s (I don’t know how she and her husband do it – I’m knackered with 2 acres!). She talked and I listened while my frozen shopping melted in the car, but it felt wrong to rush off and miss the opportunity just to stop for a while. 60 acres and in their 80’s…wow. I’ll bet she has got a lot of interesting stories Sonya. I’ll also bet she really enjoyed talking with you. I hope somebody worries about us when we are old. I once stood behind and old lady at the check out. Her things had been added up and the girl told her the amount, but she had forgotten her purse and had to leave the things behind. How I wish I had paid for them. Now that’s sad…The poor old lady. The trouble with those sorts of situations it usually takes me a couple of hours to process what I should have actually done. I’m usually so distracted by The Monkeys making sure ones not trying to escape, and the other one trying to dismantle something. The old brain cogs of mine aren’t often in synch. I am visiting a friend on Friday who would so love this sunflower bread. I can’t wait to make it for her! Thanks. Excellent Kate! Let me know how it turns out. The bread would be good with soup. I took that one to a party, where you are right it was great to be pulled apart. That is just lovely, Brydie! The bread, the stories, the loving concern. You are a loving and kind woman and very talented as well! And how perfect that you are teaching your sons to be loving men as they see your heart for others. Your post has brightened my day-thank you! Honestly…snow and ice, with temps below zero sound amazing. I’ll swap you for the day! Oh, I can just see that lady in the park, so sad. Maybe you and the monkeys reminded her of someone she doesn’t see anymore? A beautiful bread, if only your ladies could see their little bit of sunshine…. So many ‘what ifs’ to think of. Lovely post. Sunshine bread is such a creative idea. I have a couple of questions about this very cool looking (and hopefully good tasting) bread. Did you use Instant Dry Yeast? And can you tell me what Strong Bakers Flour is. I actually bake a lot of bread and that;’s something I’ve never heard of. Thanks. Hi Greg, yes to the instant dried yeast. (It makes life super easy :-)) and regarding the strong bakers flour, I’m not sure where you are but http://www.manildra.com.au/wpdata/163.pdf this is the strong bakers flour I get. As I understand it, the strong bakers flour will be stronger in gluten and protein, as compared to a standard cake flour. I hope you like the bread, and do let me know how you go with it. Thanks for your reply. I am in California. I looked at the Bakery Guide and apparently we have different names for Flour. I think they probably call it “strong” because it has a higher protein content and may be the same or similar to what we call Bread Flour which is 12.7% protein content. I didn’t see that info in the Guide, but maybe it’s listed on your package (if you have one). They don’t list that on the package here, it’s always something that is on the Manufacturers web site or can be obtained with a phone call to them. It’s not the same as the nutrtional info. that’s on packages here because it has to do with the gluten (I believe). Anyway, sorry for rambling on, but hoping you can find that info. easily Thanks! Thanks, yes that text you copied is correct…well almost. In Italy they use a flour called 00 for pizza (and King Arthur Flour here in the States makes something very close) and it’s about 10.7% protein (it’s quite soft, like a pastry flour). The strongest Flour available here is 13.7% (as far as I know) and that’s darn strong. I don’t know what you’d do with a 15% Flour….maybe build a Gingerbread house strong enough for Bears! Ohh, now I’m curious! I’ll try ringing them tomorrow and see what they say about the percentages. Let me know what you find out. I am curious too. Over here, all the experts recommend flour around 11.5-11.7% for most breads. I think the flour in Europe that is used most is in this range too (or even a bit less for some things). Most of them say that the Bread Flour at 12.7% is too strong. I use it a lot though, but I’ve been experimenting with the 11.7% and getting good results. The company haven’t got back to me, but I was talking with a baker yesterday who uses the flour and he said it’s about 12.5%. Interesting to know how they all vary. WHY DO THE TOMATOES STLL HAVE STEMS? BEAUTIFUL BREAD.